Hmmm. For the last two years (my 1st 2 years as a beekeeper), my bees haven't touched the foundation in the honey supers. They fill out the double brood boxes just fine. In spite of what I've read, I recently started feeding 1/1 sugar water in an effort to get them moving on the supers. Well, I may get sugar water in the super, but at least they'll have drawn out comb. We'll see. I just found your blog and I am so excited. I subscribed and can't wait to catch up on your old post and eagerly anticipate new ones. I like the look of your blog. I am new to bees am looking forward to seeing what i might learn. I am learning on the job with no training! This is great as I have been trying to do something like this with my bees. The tip from Keren I believe is the secret and going to test it out myself asap. Thank you! How did things work out? Did you get a decent harvest? I found that Beekeeping is a fantastic hobby, and I would like to make it my living, do you have any tips for me? I am in the process of supplying Package Bees to fellow hobby beekeepers. This means I am making some money and on the way to making it my primary income source. Τις καλύτερες ευχές για το νέο έτος. It is rather interesting for me to read the article. Thanks for it. I like such topics and everything that is connected to them. I would like to read more soon. Interesting. It looks like you use 2 deeps for brood stock and add medium supers. 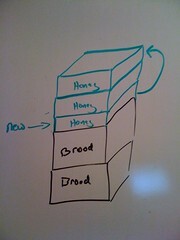 Have you thought about using all supers so you can be more flexible with moving frames with brood or honey around? I am planning to swith over to using all mediums because of the interchangability it offers. So spring is here….. Time for a new entry. Time to update this website with your current beekeeping adventures. I've just started getting into beekeeping, so I found this information very useful. Just need to catch up with some info.